Sleep. Sometimes it's hard to come by in Vegas. But for the resortist, it's an integral part of the perfect stay. Here, you'll find three classic takes on casual elegance. Regardless of which tower you ultimately choose, you'll enjoy one of the premier stays in Vegas. And when you step out, we now offer Wi-Fi in all public areas of the resort, so whether you're shopping, dining, gaming, or seeing a show, you have all access all the time. Marble spa tubs, 42" plasmas and lofty pillow-topped beds in every room create the perfect environment for effortless relaxation. This pool area at Mandalay Bay will impress. Called Mandalay Beach, it spans a whopping 11.5 acres. In addition to three large pools, a lazy river and 2,700 tons of white sand, there's a 1.6-million-gallon wave pool where the surf's always up. During the summer months, you can hear some of your favorite musicians perform out here at night as part of the Beach Concert series. And as if that's not enough, Mandalay Bay has two day clubs strictly for adults -- Moorea Beach Club and Daylight, where you can party with 4,999 of your friends. And for diehard shark fans, there's Shark Reef Aquarium. As its name suggests, this isn't your typical aquarium. It's filled with 15 different species of sharks and other marine predators. For your convenience, they offer self-parking in the Main Parking Garage, as well as Valet Parking. We will place an authorization on credit or debit card to cover applicable charges for room, tax and resort fees, as well as a $100 incidental amount per day to allow you access to room charging privileges. This may result in additional authorizations should your charges exceed the originally approved amount. Guests using a debit card in lieu of a credit card acknowledge unused funds are released upon check-out may take 3-7 business days for domestic banks and up to 30 days for international banks to become available through their financial institution. Restaurants Mandalay Bay has the following dining options: Aureole, Bayside Buffet, Beach Bar & Grill, Border Grill, Citizens Kitchen and Bar, Fleur by Hubert Keller, House of Blues, Kumi Japanese Restaurant and Bar, Lupo by Wolfgang Puck, Mizuya, The Noodle Shop, Raffles Cafe, Red Square, Stripsteak, Sports Book Grill and a food court in the convention center area. There are also two Starbucks (one near the convention center and one at the entrance to Mandalay Place) and Yogurt In. Additional restaurants located in the Mandalay Place shopping area: The Burger Bar, Hussong's Cantina, Rí Rá, Rick Moonen's RM Seafood, RX Boiler Room and Slice of Vegas. In Delano Las Vegas, there is Della's Kitchen and 3940 Coffee + Tea. Entertainment Entertainment includes Michael Jackson ONE by Cirque du Soleil and headline acts and concerts in the 12,000-seat events center or on Mandalay Beach and three lounges. The House of Blues live music venue seats approximately 1,500 people and features Santana among the live music performances. Nightlife Foundation Room, Light, House of Blues and eyecandy. There are also two frozen drink stations on the property with Evening Call located near the resort's show theater. 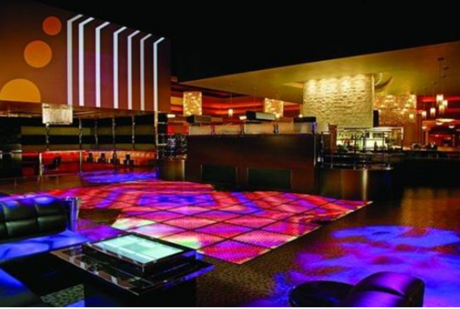 Minus5, Rí Rá, 1923 Bourbon & Burlesque and a Fat Tuesdays are in The Shoppes at Mandalay Place..
A $37.00 (plus tax) Daily Resort Fee is applied to each hotel reservation and includes amenities that are sure to enhance your experience at Mandalay Bay. No early departures. No refunds will be given for guest who check-out before initial depaure date. min $300 smoking fee assesed for smoking in non-smoking rooms. 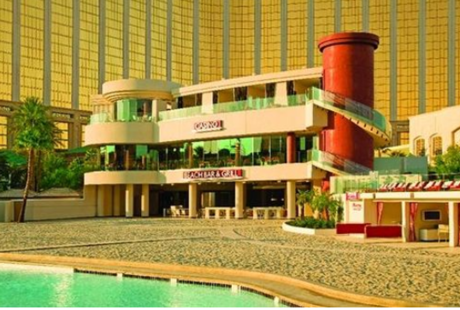 Mandalay Bay Resort And Casino is an ideal Las Vegas lodging choice for your trip to Nevada. 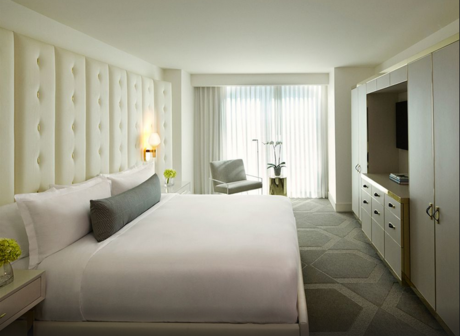 With numerous amenities for guests such as room service, 24 hour front desk, cable/satellite tv, you will wake up at Mandalay Bay Resort And Casino feeling excited every day for your time in Las Vegas. 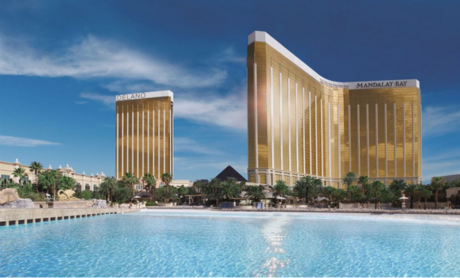 Don’t let this amazing reservation opportunity pass you by, book your stay at Mandalay Bay Resort And Casino today to make the most of your time in Las Vegas, Nevada.